I have highlighted the phrase that is critical, in my opinion. The EU was not just asking Jersey to consider the economic substance requirements for entities doing business in Jersey; it was also asking them to consider the economic substance requirements of entities conducting trade through Jersey. In my opinion (and it is, of course, only an opinion) any company incorporated in Jersey is conducting trade through the jurisdiction even if it is not economically resident there. What else can 'through' mean when 'in' clearly means 'resident'? I have, again, highlighted the key text. Jersey is only issuing guidance for companies that are resident in Jersey, and not for those that trade through it, and yet we know that only 13% of jersey incorporated companies are resident in the island, with the rest being resident 'elsewhere', with Jersey admitting they have no idea how that is determined or where 'elsewhere' might be. The guidance does not come close to offer guidance on how residence is determined. Nor does it suggest what disclosure is required by non-resident companies. And it does not say what evidence will be expected to prove that non-resident companies are resident elsewhere - which is a key issue to the EU in tackling offshore tax abuse. After all, this is what its whole case against Apple is about. 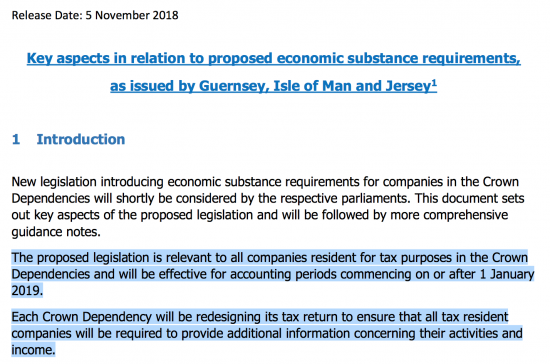 In that case, my comment is quite straightforward: this guidance note as spectacularly misses the point of the EU's intention as the draft legislation does, and will not prevent Jersey (and Guernsey and the Isle of Man, if they follow suit) joining the EU tax haven blacklist. I think the key aspect here is “trade”. 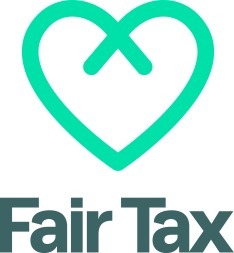 A passive asset holding company (which the vast majority of companies administered in Jersey are, as they are holding private wealth) is not “trading”. It is not generating profits from “trading” activities. It will be generating interest, dividends or rental income simply by holding assets. The definitions of “trading” versus “non-trading” are pretty well established in international tax law. It is hard to see that a passive investment holding company with a discretionary managed portfolio could be “trading in” or “trading from” Jersey. Such companies require negligible substance to carry out such activities. The only decisions are who to appoint to manage the investments, reviewing whether the investment portfolio is performing adequately, and whether or not to declare a dividend. Not quite. 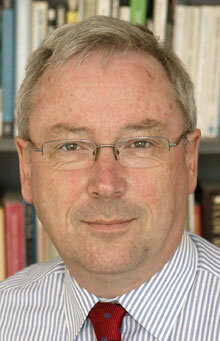 Those companies will all be resident in Jersey (management and control test). They won’t be resident “elsewhere”. They just won’t be “trading” anywhere because they aren’t “trading” at all. To trade, there must be a counterparty and so one would be either “trading in” or “trading with”. But if not actually trading at all, then it’s not an issue. Will they add Brexitania to the blacklist?